Join me for an Introduction to Aerial Yoga. I’m delighted to host 1 aerial yoga workshop per month for Jan, Feb & March. In the workshop I will offer authentic yoga, with the support of a soft, aerial fabric hammock suspended from the ceiling — to explore, refine, and advance traditional yoga poses (asanas), both in the air and on the ground. Strength, Mobility and Flexibility combine together in this revolutionary practice. Uniquely developed for beginners through all levels of experience. Escape the world outside suspended in a super strong, silky hammock that envelops your body like a protective cocoon. In a small class size, you’ll explore new and traditional yoga asanas (yoga postures) with your body weight partially or fully supported. You’ll get a ‘yoga high’ by deepening your practice: experience physical release, refined strength, energetic flow, and heightened awareness of breath and body. Never more than a few feet off the ground, you’ll let go into gravity, be held in the hammock & leave blissed out! Whether you are a long-time Yogi, or dreaming about trying Yoga for the first time, this is a fun and playful way to discover Yoga from a new perspective. 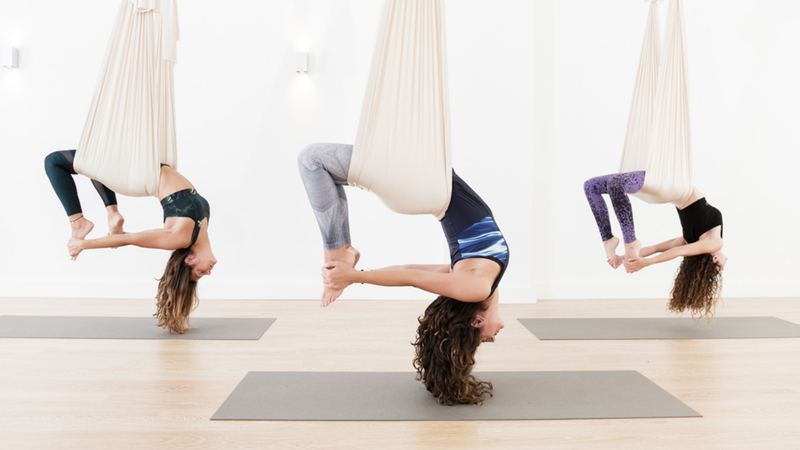 This Aerial Yoga class is not about flips & tricks (there’ll be a few if you wish to try, but it’s not an acrobatics class), instead it teaches deeper body awareness in multidimensional space. What to bring: Your yoga mat, blanket & water. Please wear fitting clothes and not to eat for at least 1 hour before the class. Suitable for: Uniquely developed for all levels of experience. No previous aerial, acrobatic, or Yoga experience is necessary. You need to be over 18 years old to attend. Please be advised… Aerial Yoga is not recommended for individuals who experience any of the contraindications listed below.